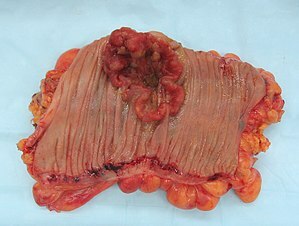 Neoplasm is an abnormal growth of tissue, and, when it also forms a mass, is commonly referred to as a tumor. This abnormal growth (neoplasia) usually but not always forms a mass. Prior to the abnormal growth of tissue, as neoplasia, cells often undergo an abnormal pattern of growth, such as metaplasia or dysplasia. However, metaplasia or dysplasia does not always progress to neoplasia. The word is from Ancient Greek νέος- neo "new" and πλάσμα plasma "formation, creation". A neoplasm can be benign, potentially malignant, or malignant (cancer).